Cloisonne jewelry – Cloisonne enameled clownfish set in an 18k gold necklace. 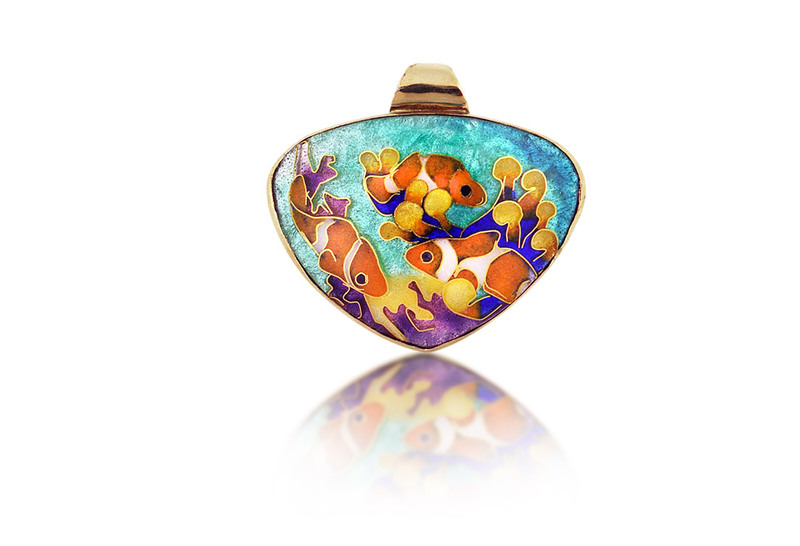 Clownfish in Reef is a cloisonne jewelry piece created by enamel jewelry artist Patsy Croft. It belongs to Ocean collection of amazing enamel jewelry with unique jewelry designs. These are the cutest little guys in the ocean. Nowonder so many people love them.And as an enamel jewelry artist and advanced diver they are the prefect subject of cloisonné enamel jewelry. Clownfish or anemonefish are fishes from the subfamily Amphiprioninae in the family Pomacentridae. Thirty species are recognized: one in the genus Premnas, while the remaining are in the genus Amphiprion. In the wild, they all form symbioticmutualisms with sea anemones. Depending on species, anemonefish are overall yellow, orange, or a reddish or blackish color, and many show white bars or patches. The largest can reach a length of 15–16 cm (5.9–6.3 in), while the smallest barely achieve 7–8 cm (2.8–3.1 in). They are so smart they can actually move large shells and items on the reef floor to add protection to nesting.